Upscale tasting features best chefs in New Orleans and Nashville with focus on Belgian and Belgian-inspired beers. Austin, TX (February 5, 2018) – Artisanal Imports is excited to announce its supporting sponsorship of the third annual “Belgian Night,” a showcase of exemplary pairings. Nuit Belge 2018 will be held on March 9 at Generations Hall in New Orleans, and on June 23 at Marathon Music Works in Nashville. Each event will highlight a dozen of the top local restaurants and chefs from each of these esteemed food cities, plus two out-of-town visiting chefs, acting as a “cultural kitchen exchange.” Each chef will be presented with two beers and will create purposeful food pairings for both. The all-inclusive events will entitle patrons to receive custom Sahm glassware along with a guide to the selections, including unlimited bites and pours. In addition, guests will enjoy chocolate, cheese and raw bars, plus live music and more. Detailed information about the events, as well as a guide to Belgian beer, is available at www.nuitbelge.com. Updates can also be found on Facebook and Instagram. Belgian Golden Strong, Trappist Single, Belgian Dubbel, Gueuze, Lambic, Saison, Witbier and Flanders Red. Among the many renowned Belgian breweries that will be represented are Brouwerij Bosteels, Brasserie St. Feuillien, Brasserie Cantillon and Trappist Brewery Koningshoeven. The events will also feature American craft breweries such as Blackberry Farm Brewery, NOLA Brewing and others that have taken up the challenge to brew their own interpretations of classic Belgian beers. Belgians have centuries of culinary tradition that includes beer, and beer has unlimited flavors and textures with which to pair food. 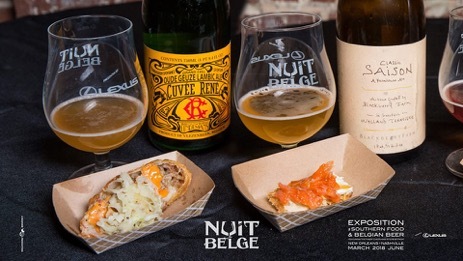 Nuit Belge 2018 will have something for everyone; don’t miss this unique experience featuring the world’s best beer and one-of-a-kind recipes. Interested in attending Nuit Belge 2018 in New Orleans or Nashville? Don’t wait! Tickets are now available here. For more information about Nuit Belge 2018, or for interview opportunities with the participating breweries or kitchens, please contact Matt Leff with Rhizome Productions at matt@rhizomeproductions.com. For more information about Artisanal Imports and its renowned lineup of Belgian breweries and beer, please contact Lanny Hoff at +1 (612) 245-5433 or by email at lanny.hoff@artisanalimports.com. About Rhizome Productions: Leveraging ties to the culinary, brewing, and hospitality industries, Rhizome Productions create events that bring connoisseurs closer to the masters of their craft. Nashville-based Rhizome Productions operates 15-18 events per year in cities across the Southeast, including Nashville, Chattanooga, Atlanta, New Orleans, and Charleston. All Rhizome events are mutually beneficial, and the company has raised over a half a million dollars for local charities since 2011. Learn more here.